Last weekend was a bit of a disaster with just 41 QSOs in the Open Ukrainian RTTY Championship which was even more disappointing as I’d messed up the dates with the EA PSK63 contest. That particular contest was this weekend and so due to other commitments, I only had a few hours to play today with no time available tomorrow. Due to all the solar activity over the last week, I had no idea how conditions were going to be and in the end, they weren’t great but the good thing was that there was plenty of activity. I knew I had about three hours to use and had originally intended to use that time on 15m. I was on in plenty of time with the amplifier warmed up and ready to go and in the lead up to the start of the contest I worked a few stations. When the minute ticked over to the start time the band exploded with activity, it was such a contrast to last weekend. I had nearly 20 QSOs in the first ten minutes and the rate stayed nicely high for the first half hour and then it dropped off quickly, so quickly in fact that after 48 minutes I decided to switch over to 20m and see how that was performing. 20m took a little while to ‘warm up’ for me but once it did, it was good with plenty of stations calling me up until around fifteen minutes or so before I’d planned to end when things quietened down again. Over the three hours of the contest, I worked 149 stations which gave me a good average of fractionally under fifty QSOs/hour which is a nice respectable rate. I didn’t work any great DX with the best being just a handful of North Americans but that’s not too surprising considering how conditions were. Here’s my analysis of the contest in half hour chunks. 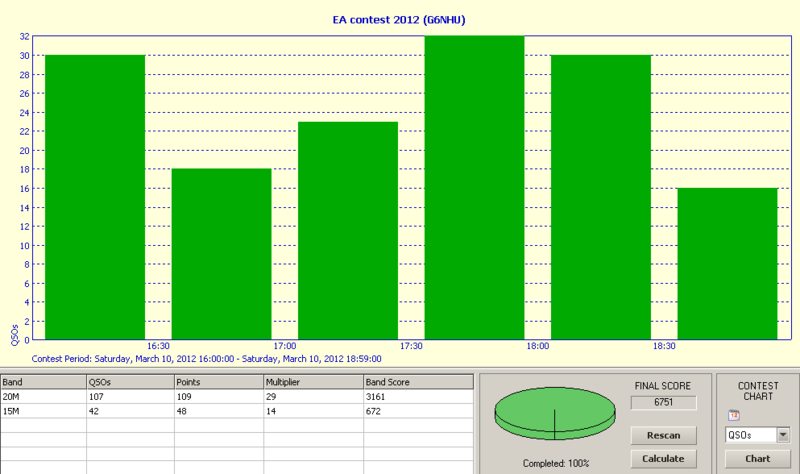 The second period is when I decided to switch over from 15m to 20m and the final one is where it all slowed down a bit. You can click for the full size image. And finally, here’s my QSO map of the 126 stations who choose to have their details on qrz.com. As expected, plenty of Europeans and again you can click for the [much] larger version. This entry was posted in Amateur radio, Contesting, HF and tagged EA PSK63 Contest 2012, PSK63. Bookmark the permalink.